Smart pedestrian infrastructure spurs urban development. 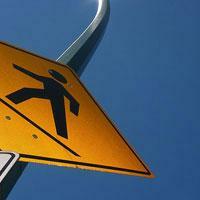 Jay Stevens says it?s time for drivers to yield the right-of-way to pedestrians. Read this: ?When traffic signals are not in place or not in operation, the driver of a vehicle shall yield the right-of-way to a pedestrian crossing the roadway within any marked crosswalk or unmarked crosswalk at an intersection.? Recognize it? It's Pennsylvania law. Title 75, Section 3542(a) of the Pennsylvania Consolidated Statutes, to be exact. And I suspect not a single driver in Erie knows this law exists. At least that's my experience at crosswalks across the city. I can edge right off the curb and onto the street in a brightly marked crosswalk, and no one will stop. I can be standing at an intersection with a large group of children walking home from school, and no one will stop. The only time I see cars stop is when our neighborhood crossing guard stands in the middle of the street and waves her orange flag, and even then it's touch-and-go. Cars sometimes screech to a halt only inches from her, the drivers glare, presumably upset at the interruption to their forward progress. Walking is dangerous. Drivers' pugnacious attitude towards pedestrians has a cost. Here in Erie, according to Transportation America ? a group committed to better pedestrian infrastructure ? 30 pedestrians have died between 2000 and 2009, almost 9 percent of all traffic fatalities. Pedestrians, too, are usually the most vulnerable among us: the poor, the elderly, the young. The solution? Smart traffic design. Like the bump-outs being built at 12th and State, which are being panned by many Erie drivers, who, among others things, complain that the bump-outs impede the flow of traffic. But here's the thing. When we drive, encased as we are in our sound-proof metal boxes ? perhaps coffee at our elbow, music on the stereo ? we're removed from reality. We objectify everything outside our cars and miss what's important. We want to get to where we're going, we don't consider the larger issues. For starters, bump-outs save lives. They increase the visibility of pedestrians and force drivers to slow down at key intersections. For another, smart pedestrian infrastructure spurs the development of urban areas. People want to hang out in walkable neighborhoods with lots of restaurants and shops. Building crosswalks and curbs for pedestrians creates the kind of infrastructure around which we can build a vibrant downtown, increasing property values and the tax base. If we want a revitalized downtown, it has to start with pedestrian-friendly infrastructure. And last, walking will save the world. It's our future, by necessity. Cars burn fossil fuels and spew toxic pollutants and Earth-busting greenhouse gases into the atmosphere. If we want to avoid turning our planet into a desert, we'll bike, beef up mass transportation, and redesign our neighborhoods and city infrastructure to support more smaller, local shopping and entertainment venues. But most important of all, we'll walk.